Mzuzu University Malawi is partnered with University College Cork, Ireland. 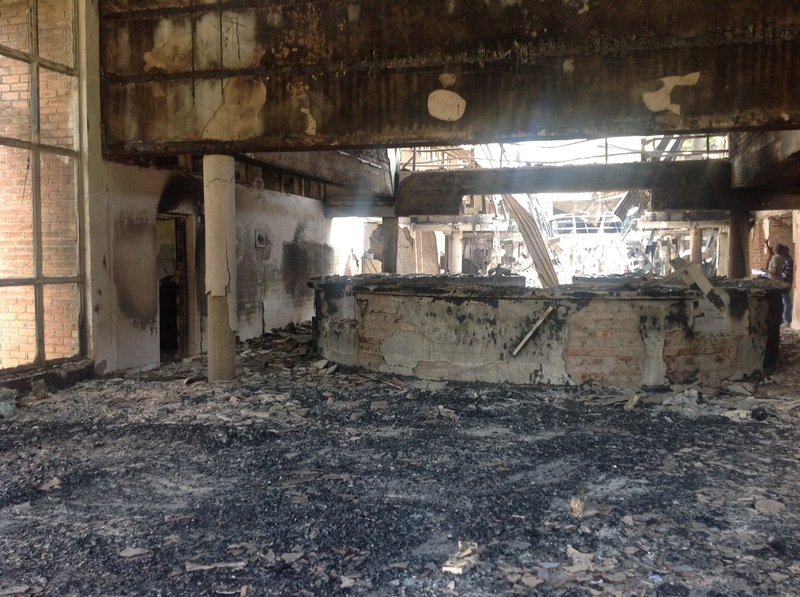 On Dec 18th, we received the news that a devastating fire at MZUNI University Library had just destroyed 45,000 books, the lifeblood for 4,000 University students who depend on it. The staff and students at MZUNI are appealing to anyone, but particularly its partners, for help. Help includes: funding to support a temporary library facility, access to e-resources and/or gifts of books to populate the temporary facility. Any assistance from Higher Education Institutions and particularly Libraries, would be most gratefully received to assist them in their plight. Please help if you can. I recently visited MZUNI on a capacity building project and I was in that Library in September, and I admired it, especially the dedication of its staff’. Although not resourced with ‘state of the art’ facilities – and still very much dependent on the text book - and with little access to computers or the internet, nevertheless, it worked. It was a lovely library with a lovely atmosphere. It was used and loved very much by the students. They had study areas attached to the reading areas, again, equipped with no powerpoints, indicative of the lack of technical resources available to staff or students. Nevertheless, the Library hummed of busy minds reading, studying, and the sound and smell of turning pages and older books was one I had not experienced for a while. Impressed by its form and function, I took many photos of the library, and that is what made the news so shocking for me. And if it was bad for me, it must be totally devastating for MZUNI staff and students – their bright, airy, vibrant library resource lost, overnight. Devastating, just devastating! Fr John Ryan, an Irish Kilteagan priest and Professor of Maths at Mzuzu University, with over 40 years experience in Africa says "The fire has indeed been a devastating blow to MZUNI and it is only by a concerted effort by all partners, stakeholders and friends that we can 'solve' this one. The main focus of the university is to remain open and to keep to the academic calendar for the sake of the students. Any help given will certainly be very much appreciated by Mzuzu University. Mzuzu is the main city in the northern region of Malawi which is often regarded as isolated and 'not developed' even to Malawian standards. And Malawi is now ranked the poorest country in the world, ranked according to per capita income." Dr Ridley is trying to connect with as many partners and stakeholders as possible as it is only through a concerted effort that this can be solved. Any assistance for MZUNI library would be gratefully received. If you are able to, and wish to, help please find details of the account as well as the Bank Swift code for Standard Bank Limited, Mzuzu Branch. Funds can be transferred through TT (Telegraphic Transfer) to this account. Note that it is a US$ account. In March 2015, I was delighted to receive the news that I was the recipient of the SLA Europe Early Career Conference Award (Legal Division) for 2015. I first heard about the Special Libraries Association when I attended the first SLA Europe Chapter event that was held in Ireland, the “New Professionals Guide to Knowledge Management in Legal Services. The event was hosted by Lauren Lawler (winner of the SLA ECCA (Legal Division) 2013). Shona Thoma wrote a summary about this event for the SLA Europe Chapter website. Hearing about the excellent experience Lauren had at the SLA Annual Conference & INFO-EXPO really motivated me to get involved with SLA and apply for the award. The application process was a really useful exercise. I found that it was a great way to reflect on different skills I had developed since I completed my MLIS, and also to reflect on the different aspects of my current position. This year, there are three ECCAs on offer and I highly recommend that anyone within the first five years of their career apply. To save yourself some frustration, ensure that you are eligible for the award and that you give yourself plenty of time to work on the application. While the process is straightforward, given that there is a recommended word count of 1500 words, it means you really have to ensure that you get everything you want to say down on the page in the most concise way you can. You’ll need time to work on the various parts of the statement and your CV, along with organising a letter of recommendation. It would be brilliant to see more librarians and information professions in Ireland getting involved in SLA and this award is the ideal stepping stone. Before the conference I was assigned two mentors, Tracy Z. Maleeff (SLA Legal Division) and Laura Woods (SLA Europe Chapter). Both Tracy and Laura provided me with so much information about the conference which was so helpful when I arrived in Boston. If you do get the opportunity to travel to the SLA Annual Conference & INFO-EXPO 2016 in Philadelphia as an ECCA winner, you will be well-informed before you arrive! My employers Mason Hayes & Curran are very supportive and encourage my involvement with SLA, especially my library colleagues Anne Whelan and Áine Finegan. As of January 2016, I am one of the directors of the SLA Legal Division executive board. My role includes updating the SLA Legal Division website. Becoming involved with SLA will really benefit your career and it is a great way to network with librarians and information professionals from all around the world. The closing date to apply for the award is Friday 19th February 2016, 23:59 GMT. See the SLA Europe Chapter website for more information and application instructions. I’m the subject librarian supporting the DCU Business School and recently completed the move to online-only IL instruction to teach the library basics to first year undergraduates in their first semester. The Business School takes in nearly 1,000 UG students per year and it’s always been a headache planning instruction for all their different programmes. I was embedded in one of the larger modules and delivered this in a blend of lecture, workshop and online assessment (which my predecessor wrote about here). This rushed-but-effective approach taught 300-400 students and I used to catch the rest of them with a dozen or so workshops for smaller groups but there were always gaps as programmes and modules changed year by year. So last semester, in collaboration with the School’s Teaching and Learning Committee, we identified the one core module that all first years take, Introduction to Microeconomics (EF113), and the lecturer agreed integrate the training with his module. In the early weeks of semester 1, all students do an asynchronous tutorial hosted on the EF113 Moodle page (here’s a public version of it). It’s a combination of video, text, activities and quizzes I created mainly using Articulate Storyline. This takes them about two hours to complete and it covers IL basics like understanding reading lists, academic publications, citing and referencing etc. Next the students complete a microeconomics exercise on finding and manipulating data from sources like the Central Statistics Office and Revenue Commissioners. And finally they do a summative MCQ on both of the above which accounts for 5% of their marks for the module. The students had two weeks to complete all of this. There were a few issues with the technology on Moodle but nothing serious. Whenever there were any issues from students with the content or the tech I was able to respond by email or face-to-face in the Library and resolve it quickly. Other benefits for the students were that they could control of pace of learning, it was (and remains) open to them whenever they need it and they got immediate feedback on their learning from the quizzes and activities. While I'm satisfied that running automated, online-only training works for first year UGs, I won't be using this approach much for other cohorts like final year students and postgraduates. Teaching here is more specialised and done in smaller groups so it's manageable to deliver it face-to-face and these groups, especially the School's executive education students, value the hands-on workshops in a way I've never really experienced with the first years (it's very hard to get Irish teenagers straight from secondary school to open up!). More interactivity in the tutorial. Working with the lecturer to find ways to integrate the IL elements more seamlessly with the module. Improving the assessment. While I’m largely happy using MCQs as an assessment tool, I find it’s not as effective with the more subjective elements of the curriculum like evaluating sources, which the students fell down on. I have enrolled in an online module on assessment & feedback taught by DCU’s Teaching Enhancement Unit and I hope to make this my project. I’m thinking of something like including a peer-evaluated exercise on a short piece of reflective writing. We’ll see. The second annual Conference of the Consortium of National and University Libraries will take place on Wednesday 1st and Thursday 2nd June 2016 at the Sheraton Athlone hotel. Please note that conference speakers will be required to register for the full residential conference and presenters may be recorded for live streaming. A recording of the presentation and a copy of the slides may be published online after the conference. Posters may be published online after the conference. CONUL is also delighted to announce a bursary which will fund the recipient’s attendance (registration and accommodation) at the 2016 CONUL Conference. The bursary will be awarded based on a poster presentation which will be exhibited by the successful applicant at the 2016 conference. The poster should address an aspect of the conference theme Going Further Together: Collaboration in Irish Academic and Research Libraries. Application is open to staff of CONUL member institutions who have not previously presented at conferences. The closing date for application is 15th February 2016. Last but not least, feel free to chat about us on twitter using hashtag #conulac16.